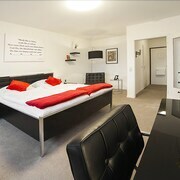 Located in Mitte, this hotel is within 2 mi (3 km) of SpielBank Hannover, HDI Arena, and Maschsee. Hannover Zoo and Hannover Congress Centrum are also within 2 mi (3 km). Central U-Bahn is only a 4-minute walk and Kroepcke U-Bahn is 8 minutes. 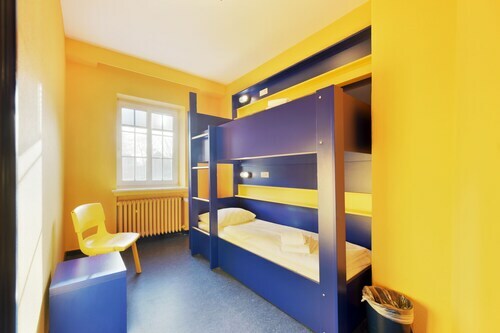 Located in Wuelfel, this hostel is within 2 mi (3 km) of Luftfahrt Museum, Hannover Fairground, and Maschsee. TUI Arena is 2.5 mi (4 km) away. Laatzen Hannover Messe-Laatzen Station is 21 minutes by foot. Located in Vahrenwald, this hotel is within 3 mi (5 km) of Lister Platz, Sea Life Hannover, and Hannover Zoo. Hannover Congress Centrum is 2.6 mi (4.2 km) away. Werderstrasse U-Bahn is 23 minutes by foot and Hannover Nordstadt S-Bahn is 24 minutes. 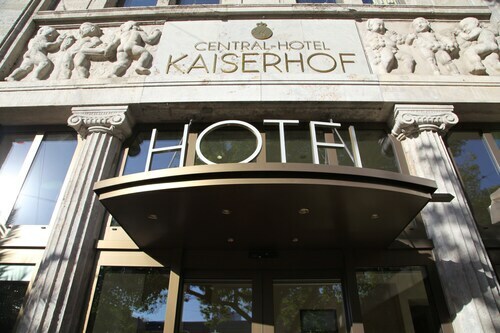 Located in Mitte, this luxury hotel is within 1 mi (2 km) of Kroepcke, HDI Arena, and Maschsee. Hannover Congress Centrum and Hannover Zoo are also within 2 mi (3 km). 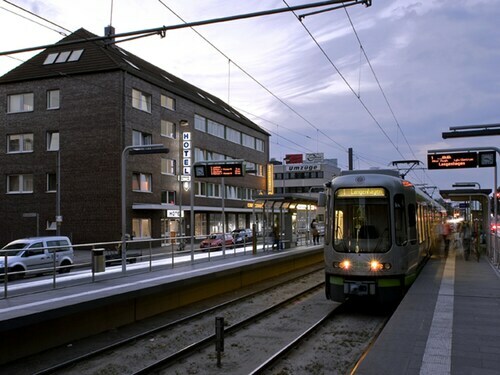 Kroepcke U-Bahn and Hannover Central Station are within a 5-minute walk. Located in Mittelfeld, this luxury hotel is within 1 mi (2 km) of Expo Museum, TUI Arena, and Hannover Fairground. Expo Park and Hannover Convention Center are also within 1 mi (2 km). Laatzen Hannover Messe-Laatzen Station is 28 minutes by foot. 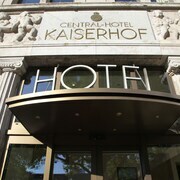 Located in Mitte, this luxury hotel is within a 15-minute walk of New Town Hall and Opera House. Marktkirche and HDI Arena are also within 1 mi (2 km). Schlaegerstrasse U-Bahn is only a 2-minute walk and Geibelstrasse U-Bahn is 8 minutes. Located in Region Hannover District, this luxury hotel is within 1 mi (2 km) of Leine Center Laatzen and Hannover Fairground. TUI Arena is 1.3 mi (2.1 km) away. Laatzen Hannover Messe-Laatzen Station is 25 minutes by foot. How Much is a Hotel Room in Hannover? Hotels in Hannover start at $38 per night. Prices and availability subject to change. Additional terms may apply. If you're an authentic experience in Lower Saxony - Bremen and are on the lookout for a place to stay around Hannover, Travelocity has a comprehensive array to choose between. Our database is where the modern traveler can find 104 establishments within a 6-mile (10-kilometer) radius of the center of Hannover. 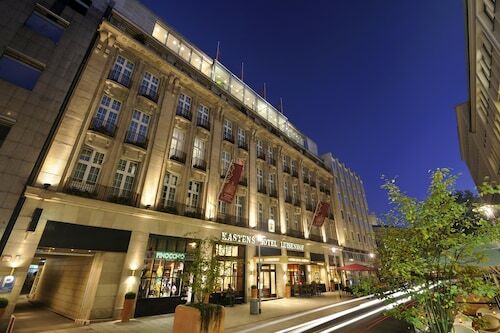 Among the more central hotels of downtown Hannover are the Kastens Hotel Luisenhof and Mercure Hotel Hannover City. Mitte, a popular neighborhood with 51 Travelocity-approved hotels, is 0.8 miles (1.3 kilometers) from the downtown precinct. Amongst the more popular of the hotel establishments in this area are the Cityhotel Königsstraße and Sheraton Hanover Pelikan Hotel. Alternatively, perhaps you want to experience Hannover like a local? If so Hildesheim, Langenhagen and Vahrenwald all lie just outside of the CBD district. 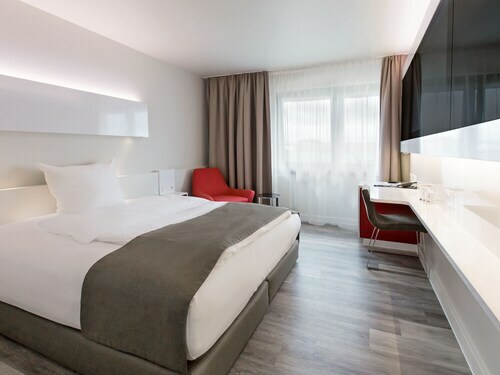 In Hildesheim you can take your pick from rooms in the Van der Valk Hotel Hildesheim and Novotel Hildesheim. 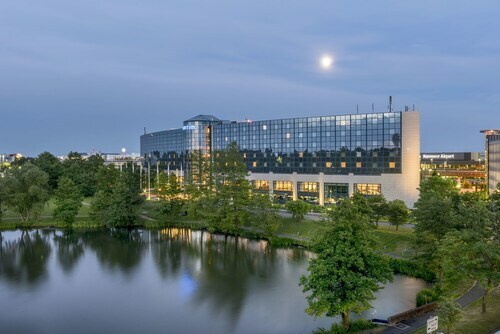 While Langenhagen's well known hotels include the Leonardo Hotel Hannover Airport and Maritim Airport Hotel. The Novotel Hannover and Fora Hotel Hannover currently have room waiting to be reserved, if it is in Vahrenwald that you stay. 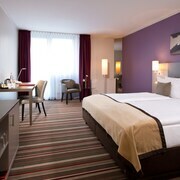 Travelocity accommodations close to the New Town Hall are the Crowne Plaza Hannover and the DORMERO Hotel Hannover. The Room Direct - Hannover Messe and also the Smartcity Designhotel are positioned within walking distance from the Marktkirche. The Grosser Garten and the Schuetzenplatz are other significant Hannover sights. The Hotel Schlafgut and the Hotel Schwarzer Bär are both close to the Grosser Garten. 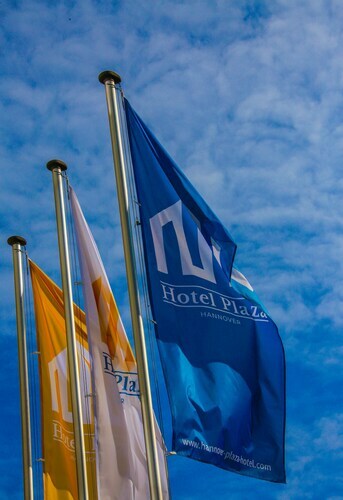 Alternatively, the Room Direct - Hannover and the Grand Palace Hotel Hannover are located nearer to the Schuetzenplatz. Budget-concious travelers can relax. Hannover features a good selection of low-cost options. The Hotel Schwarzer Bär and the Mercure Hotel Am Entenfang Hannover are alternative lower-cost places that deserve a look. The ABT Apartments - Hannover can be found 4 miles (6 kilometers) from the central part of Hannover. Also, the Arcadia Hotel Hannover is located 4 miles (7 kilometers) away. 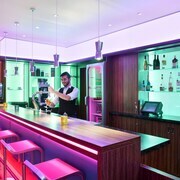 Alternate hotels are the Wyndham Hannover Atrium and the Ramada Hotel Europa Hannover. Once you and your traveling partner have got a feel for Hannover, why not discover a little bit further afield? The Lower Saxony - Bremen vicinity has plenty of places to see. Enjoy Lower Saxony - Bremen's beaches. While you're at it, wind your way through a selection of its old towns and historic mansions. Common things to do in this region of Germany include snowboarding and skiing. 35 miles (55 kilometers) away from Hannover, you can find Braunschweig, which is where you can enjoy Happy Rizzi House and Herzog Anton Ulrich Museum. 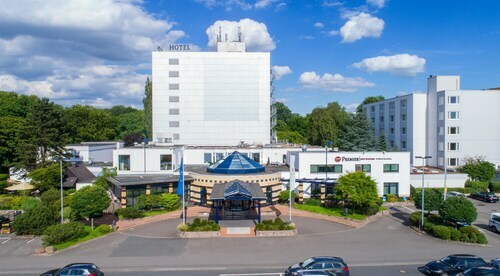 A few Travelocity-listed Braunschweig hotels and accommodations include the Steigenberger Parkhotel Braunschweig and Best Western City-Hotel Braunschweig. Or stay in Rodenberg, 16 miles (26 kilometers) west of Hannover, where you can pick from the Convention Hotel and Mein Berghof - Hotel & Steakhouse. The Heimatmuseum Rodenberg and Ratskeller Church are more frequented points of interest to experience when visiting Rodenberg. Situated 6 miles (10 kilometers) outside Hannover's downtown area is Hannover Airport. Find a room nearby at Best Western Nordic Hotel Ambiente or ACHAT Premium Airport-Hannover. Nice hotel and you can't beat the closeness to the airport. There is nothing better than crossing the street with a roof over your head and be right where your plane leaves. No A/C, the hotel was noisy with people making noise all night inside and outside of the hotel. Due to the lack of A/C the windows were open and the noise outside made it impossible to sleep. Music for bars blasting all night. Waste of money, will never go back. Problems #1: The check-in is at 3:00, rather than the standard 11:00, or 10:00 with an "early check-in". #2: Way too many smokers smoking in their rooms next to non-smoking rooms. #3: The gym is the size of a telephone booth. #4: The unisex spa is out in the open with naked people walking around (some may not consider this a problem). #5: There are smokers standing outside of the hotel in front of the narrow main entrance all of the time. #6: There is no bellboy/porter. #7: Room rate was way too high (+$600 p/n) for a 3-star hotel. (Listed as a 4-star). #8: Bed in room was supposed to be a queen, when it is a wide twin. Good Things #1 The breakfast chef...amazing eggs & cheerful no-nonsense disposition. #2 The design of the room. Although small, really well designed & nice materials/finishes. #3 The cleanliness. #4 The food. Really good. Staff was very friendly, very helpful with directions. Entire hotel very clean. 5.0 Great city center location! We were pleasantly surprised to be upgraded to a room on the 4th floor facing the back, so very quiet even though the hotel is right across from the train station and in a busy shopping area with lots of upscale stores. We really appreciated the very good and quick elevator! Also a desk clerk let us know that it was just a few blocks walk to the Opera House, thereby saving us big taxi fares because they have to drive a long way around due to one-way streets, restricted traffic zones, and pedestrian-only avenues! Must mention that the hotel restaurant was superb, including offering several authentic German dinners. And when we asked servers for recommendations of appropriate wines or beers for the food, their suggestions were perfect! The room was really big for two of us. Everything was very nice inside. There is a nice swimming pool in this hotel and it was kind of good to take some time at the pool side. We came when there was no exhibitions happening at Hannover, so I could not really tell the conditions of this hotel when it is fully booked. However, I like this hotel based on my stay!! !